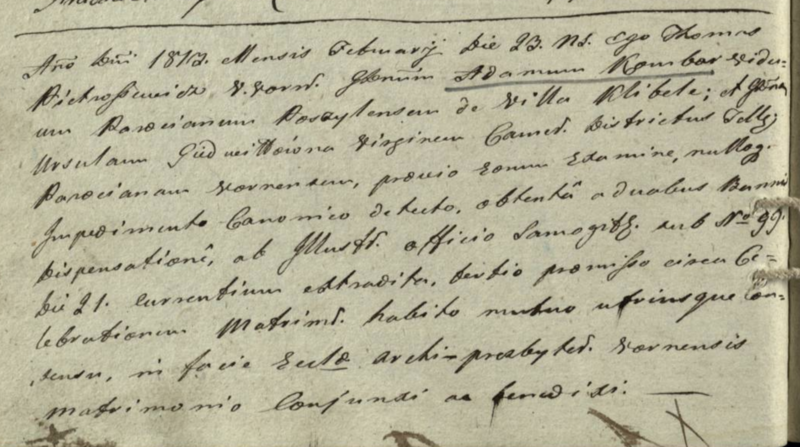 Would someone be able to assist with translating the attached marriage record from Varniai Lithuania parish? Could I please have the attached marriage entry translated? As always, thank you in advance! 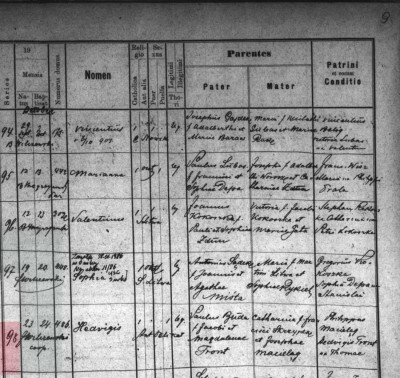 could you please translate this marriage record for me. My 4x great grandparents. could please translate this for me as well. Birth record from 1750. 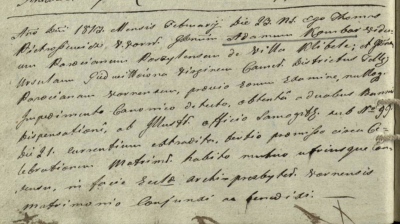 The first image you posted (V Marriage 1813 @F ePg35 (Feb) Ursula, Felicjan?s Daughter 1 of 2 smaller.png) is the marriage record and is in Latin. 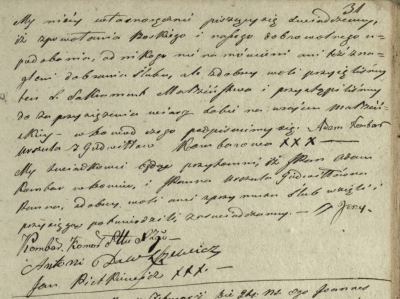 The second image (V Marriage 1813 @F ePg35 (Feb) Ursula, Felicjan?s Daughter 2 of 2 smaller.png ) is in Polish and is an affidavit on behalf of the groom. It is a substitute for the two banns from which a dispensation had been obtained and attests (via the signatures of two witnesses) to his freedom and proper disposition to enter into the marriage with Urszula/Ursula. If you feel that it is significant and worthy of a full translation, please post the doc in the Polish translations section of the forum. Again, I’m not sure of all the geography in Lithuania. Anyway, here is the translation. 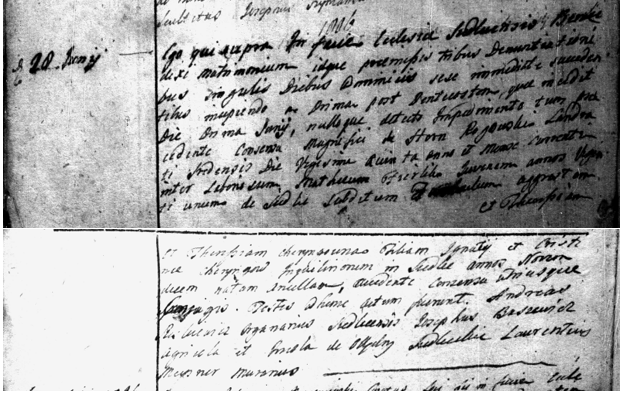 Translation: On the 23rd day of the month of February in the year of (Our) Lord 1813 I, Tomasz/Thomas (illegible surname), vicar of Varniai, after having examined* the couple beforehand and since no Canonical impediment had been detected and after having obtained a dispensation from two proclamations of the banns from the chancery of Žemaitija under Number 99 on the 21st day of the current month & year and after the third promulgation (of the banns) had been made near the celebration of the marriage, and after having received the mutual consent of both parties, in the presence of the congregation of the church of Varinai, joined together in matrimony and blessed the well-born** Adam Kombar, a parishioner of Poszyl?? from the village of Klibele(?) and the well-born** Urszula/Ursula Giedwiłłowna*** a maiden, a parishioner of Varniai. Notes: *The priest examined the couple’s knowledge of basic Catholic prayers and Catechism as well as seeking information regarding any possible canonical impediments to the marriage. **well-born/generosus,a,um: an adjective used to describe the owner of at least one village. Please post the name of the parish from which the record comes. This will lessen the time spent on the translation by eliminating the need to devote time to trying to get a handle on the geography involved in the record. Place names are usually entered in the vernacular or in the form of an adjective derived from the vernacular place name. Knowing the parish and the village saves time and effort. The same holds true of surnames—they are in the vernacular rather than in Latin. After you post this information I’ll gladly translate your marriage record. Please post the name of the parish from which the record comes and the village where the individual(s) resided. This will lessen the time spent on the translation by eliminating the need to devote time to trying to get a handle on the geography involved in the record. Place names are usually entered in the vernacular or in the form of an adjective derived from the vernacular place name. The same holds true of surnames—they are in the vernacular rather than in Latin. After you post this information I’ll gladly translate your records. could you please translate for me. Marriage of Nikodem Sedek and Salomea Tatos. 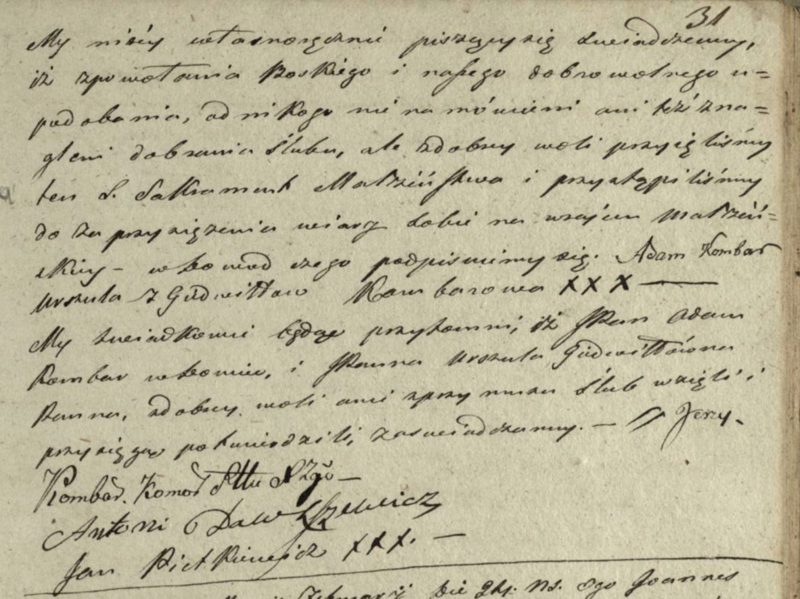 Married 1778 in Nowe Brzesko parish, Malopolskie, Poland. I think he was from the nearby Szpitary. Thanks for translating the marriage record. Sorry about the polish record. I just assumed it was a continuation (in Latin) of the first record ... I'll look more closely next time. 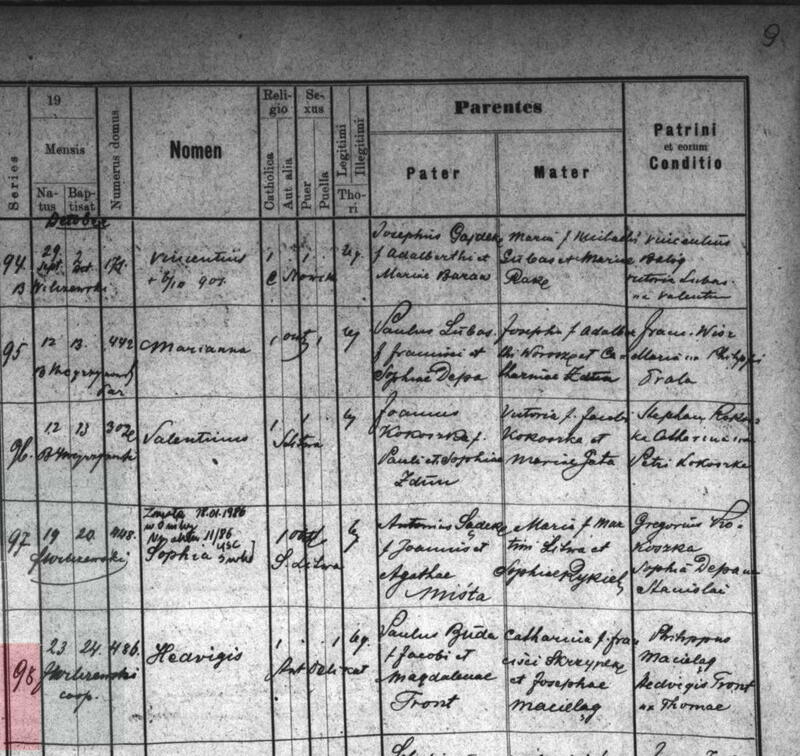 Could I please get a translation of this marriage record for my great grandparents - Paul Buda and Katherine Skryzpek? They were in Swilcza, though I’m not sure of the parish name. Thanks for including the name of the village. That info helps to not waste time on the geography in a record. It is most helpful in early short paragraph records (which are not usually found in records from Galicia aka the Austrian Partition). In the case of the marriage you posted the name of the village and the parish are the same. I did find some additional info on Polish sites which you may find interesting. The parish church was under the patronage of the apostles Saints Simon & Jude. Here is a link to the parish website: http://parafiaswilcza.prv.pl/ The church where your ancestors were married was a wooden structure built in 1636. It burned during the night of October 29-30, 1967. The site has images of the old wood church building. My ancestors were not from Galicia and thus I’m no expert on the area. Cheri has a lot of info and perhaps you can learn more from her. I saw your conversation with Diane and the scribe who entered the marriage record certainly would not win any prizes for penmanship. I’m quite confident that the entry is the marriage of your great grandparents. Their first child, Jadwiga (Polish)/Hedwig (English)/Hedwigis (Latin) was born on December 23, 1901 and was baptized on December 24. Attached is a copy of her birth & baptism record. (I forgot to copy the link.) The spelling of Paweł/Paul’s mother’s maiden name appears as Tront. Such spelling variations occur often. Her sponsors aka godparents were Filip/Philip Macielag and Jadwiga/Hedwig, the wife of Tomasz/Thomas Tront. Given names in Latin records always appear in their Latin version—a form the individual never used. Attached is a list I compiled of Latin given names in PDF form with their Polish and English translation. Perhaps you may find it useful. Surnames in Latin records always appear in their vernacular form. The translation of the marriage record follows. The marriage record is entered in the columnar format with major divisions and subdivisions of the columns. Col. 1: Series =Number (of the marriage for the year):32? Final entry: The banns were promulgated on the 21st, 22nd, & 23rd Sundays after Pentecost, November 4, 11, (&) 18; (Next follows info regarding the military unit in which the groom served. The first words are illegible. The legible portion is): of the 10th Artillery Regiment. The father of the bride gave his consent. (Illegible signature) blessed the marriage; the witnesses signed later. Notes: *He had completed his compulsory military service in the Austrian Army. **hortulanus/gardener: term used to designate a peasant who owned his cottage with enough land for a garden, but no farm fields. ***The scribe did not indicate whether the bride was a maiden or a widow. Undoubtedly she was a maiden. Thanks for posting the geographical info. Sorry that I didn’t translate the records earlier but I just saw your post with the geographical info today. Here are the translations. I hope that you find them useful. On the 23rs day of the same month (The name of the month must appear in an earlier record.) I, the same as above, joined in legitimately contracted marriage the single young individuals Nikodem Sedek and Salomea Tatosowna* from the village of Szpitari (Szpitary). The witnesses were Bartłomiej Kempta(?) and Wawrzyniec Trela. 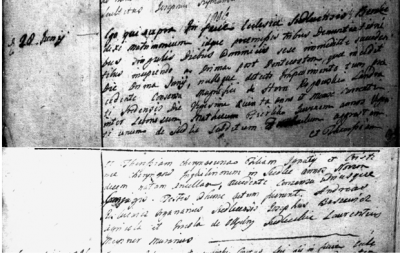 On the 30th day of January I, as above, baptized Błażej, the son of the legitimate marriage of Stanisław and Urszula Sedek/Sędek. The sponsors were Katarzyna Gatdyk(?) (and) Jakub Kura de Szpitary. Dave - I can not begin to thank you enough for your help! I’ve already learned so much and I can’t wait to go and read more from the resources you provided! Thank you Thank you Thank you!